With this book, Bob Rotella and Bob Cullen returned to the successful teaching techniques that highlighted their previous bestseller, Golf Is Not A Game Of Perfect. Again, this book won’t teach you the perfect swing or the best method for bunker play. It simply teaches a great way to think your way around the golf course. The right mental approach, paired with the appropriate commitment for the level of golf you want to play, will definitely help. Interspersed with stories of PGA Tour pros such as Billy Mayfair and Tom Kite, and LPGA pros like Val Skinner and Pat Bradley, Rotella also provides examples from average players. Including these “normal” players’ stories may provide the greatest benefits of reading these books. Tom Kite and I are almost the exact same height and weight. We’ve both played Pebble Beach. As golfers, that’s about where the comparison stops. No matter what I read about how Kite practices and plays, I always remember that difference in skill level. On the other hand, when Rotella explains how a guy named Fred Aronstein broke 80, I can easily adapt that story to my own rounds of golf. Rotella is at his best when he describes the trials and triumphs of amateurs who simply love the game and want to improve. He distills their experiences into pithy phrases that you can remember when out on the course or the range. As with Golf Is Not A Game Of Perfect, these short comments are collected in an Appendix. They are highlighted in bold face in the main text when they appear in the particular story illustrating the point. This is useful when you go back to the book to remind yourself of a particular bit of advice. 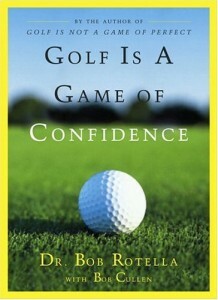 Your golf game will be improved if you buy this book and use the techniques Rotella describes.